All three systems/distributions are a based on Debian. DebEX KDE is based on Debian Jessie (Debian 8.6). 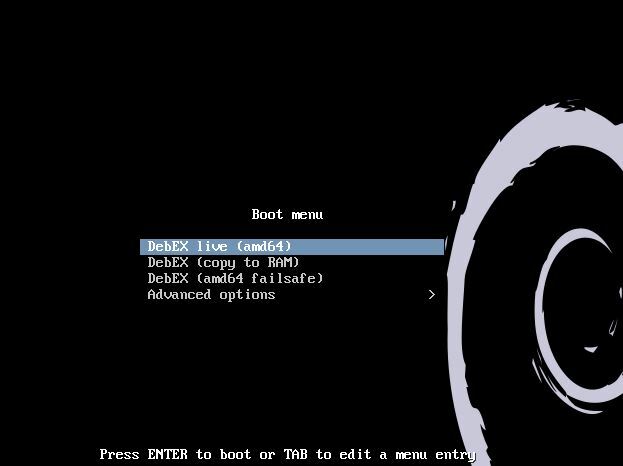 DebEX Barebone and DebEX Gnome are based on Debian testing (Stretch) and Debian unstable (Sid). Xfce 4.12 (released 150228 after about three years work!) 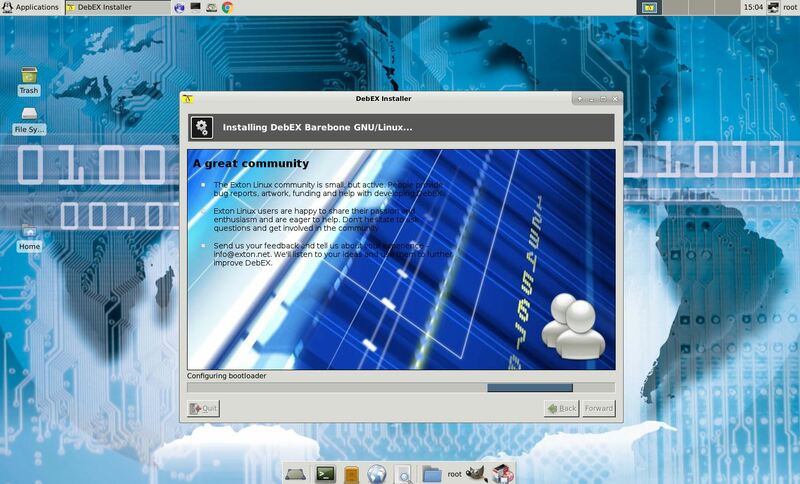 is used as Desktop environment in DebEX Barebone. 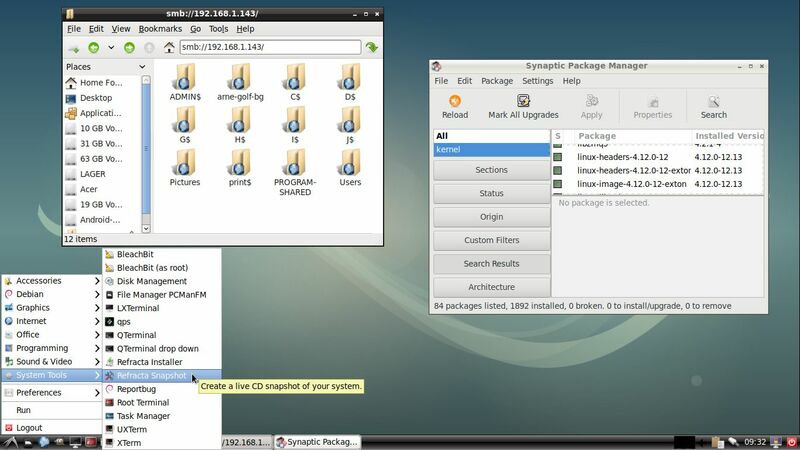 Gnome 3.22 and Mate 1.16 are used in DebEX Gnome. 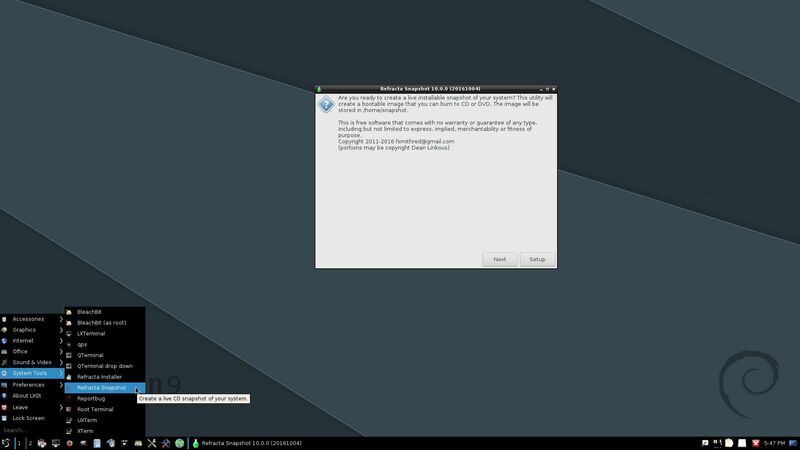 KDE 4.14.2 and KDE Plasma Desktop 5:84 are used in DebEX KDE. DebEX Gnome uses my special kernel 4.8.0-21-exton. (Kernel 4.8). DebEX KDE uses my special kernel 4.8.0-18-exton. (Kernel 4.8-rc8). DebEX Barebone uses my special kernel 4.3.0-5-exton. (Kernel 4.3.3). The system language is English (in all three versions of DebEX). I have made a new extra version of DebEX, which I call DebEX Gnome Live DVD. 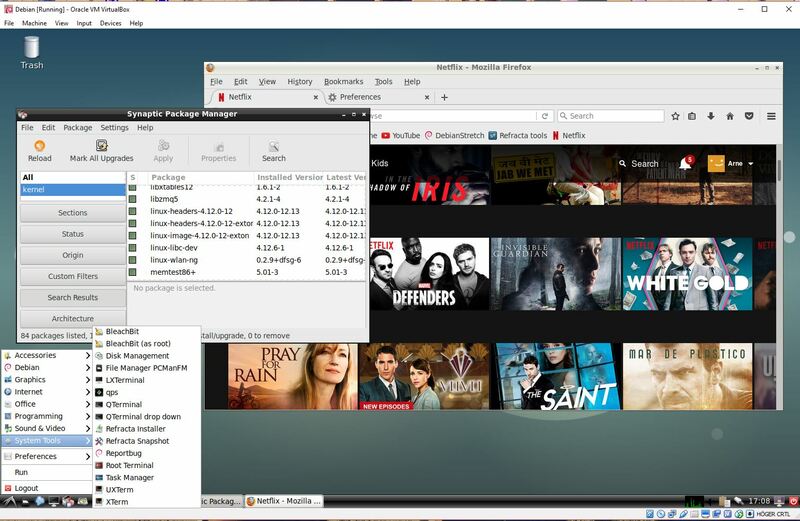 It’s a pure Debian system using the testing (stretch) and unstable (sid) repositories. Two Desktop Environments are pre-installed. Gnome 3.22 (latest) and Mate 1.16 (latest). I have also installed Nvidia’s proprietary graphics driver 370.28 in this new version of DebEX. To be able to enjoy Gnome 3.22 while running DebEX live (from DVD or a USB stick) you’ll need to have a new Nvidia graphics card installed. You can see which cards are supported here. Otherwise you’ll have to settle for Mate 1.16. (Not a bad choice btw). Furthermore I have installed Google Chrome to make it possible to watch Netflix movies. All other installed packages have also been updated to the latest version as of 161007. DebEX Gnome uses kernel 4.8.0-21-exton corresponding Kernel.org’s latest stable kernel 4.8. A new version of DebEX Barebone with Xfce 4.12.1 and kernel 4.3.0-5-exton (equivalent to Kernel.org’s stable kernel 4.3.3) is ready. I have installed Nvidia’s proprietary graphics driver 352.63. All packages have been updated to the latest version as of January 9, 2016. 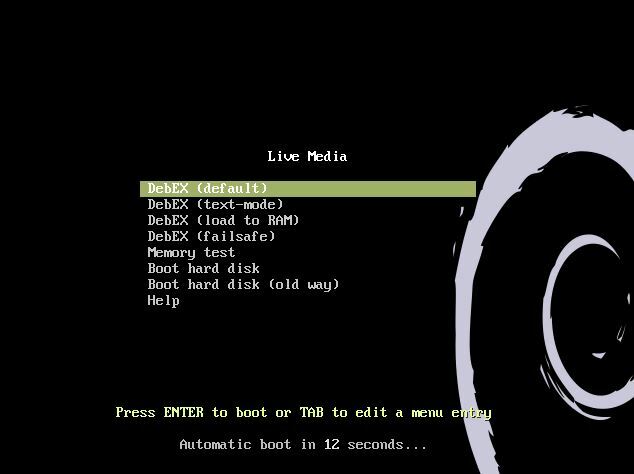 DebEX Barebone is now based on Debian testing – Stretch – (upcoming Debian 9) and Debian unstable – Sid. 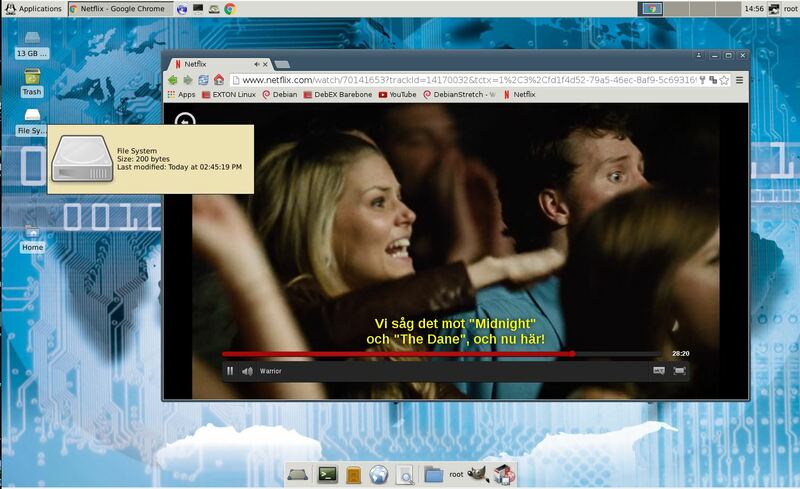 I have now installed Google Chrome to make it possible to watch Netflix movies. No Linux system is complete without it. The size of the ISO file has therefore increased from 1150 MB to 1460 MB. Announcement about Xfce 4.12, released 150228: Today, after 2 years and 10 months of work, we are pleased to announce the release of the Xfce desktop 4.12, a new stable version that supersedes Xfce 4.10. This long period can only be explained by how awesome Xfce 4.10 was. But as all things, it needed some refreshing – and for that we saw lots of new contributors providing valuable feedback, features and bugfixes. As always, Xfce follows its steady pace of evolution without revolution that seems to match our users’ needs. There are now three new DebEX systems. Namely DebEX Barebone 160109, DebEX Gnome 160105 and DebEX KDE 160102. 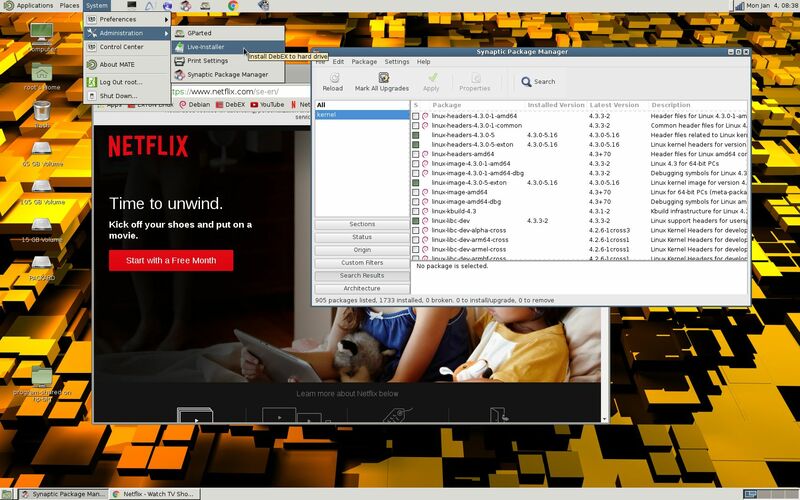 All three use kernel 4.3.0-5-exton. All three systems can run from RAM. Use Boot alternative 2 (Copy to RAM). When the system has booted up you can remove the disc (DVD) or USB stick. You’ll need at least 2 GB RAM to run DebEX from RAM. I.e. superfast! It’s absolutely the best way to enjoy a Linux live system. Especially if it is a “big” system and you have lots of RAM. (DebEX Barebone, Gnome and KDE ISO files are of 1460 MB, 1720 MB respectively 1490 MB). I have made a new extra version of DebEX, which I call DebEX Gnome Live DVD. It’s a pure Debian system using the testing (stretch) and unstable (sid) repositories. Two Desktop Environments are pre-installed. 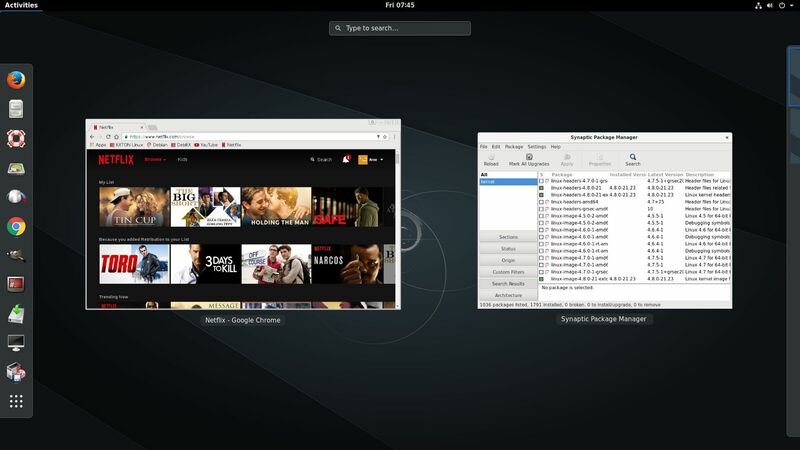 Gnome 3.18.3 – latest version – (Gothenburg) and Mate 1.12.1 (latest version). About Gnome 3.18: This release brings significant improvements to many of our core applications, from better Google Drive integration in Files to a list view in Boxes to firmware updates in Software, and several entirely new applications. I have also installed Nvidia’s proprietary graphic driver 352.63 in this new version of DebEX. To be able to enjoy Gnome 3.18.3 while running DebEX live (from DVD or a USB stick) you’ll need to have a new Nvidia Graphics card installed. You can see which cards are supported here. Otherwise you’ll have to settle for Mate 1.12.1. (Not a bad choice btw). Furthermore I have installed Google Chrome to make it possible to watch Netflix movies. All other installed packages have also been updated to the latest version as of 160105. DebEX Gnome uses kernel 4.3.0-5-exton. DebEX Gnome can run from RAM. Use Boot alternative 2 (Copy to RAM). When the system has booted up you can remove the disc (DVD) or USB stick. You’ll need at least 2 GB RAM to run DebEX from RAM. I.e. superfast! It’s absolutely the best way to enjoy a Linux live system. Especially if it is a “big” system. (DebEX Gnome’s ISO file is of 1720 MB). DebEX Gnome uses kernel 4.3.0-5-exton equivalent to Kernel.org’s stable kernel 4.3.3. (Latest as of 160105). The Nvidia driver has support for the following GPUs (among others): GeForce 800A, GeForce 800M, GeForce GTX 970M and GeForce GTX 980M. Note: I DebEX Gnome version 160105 your Nvidia card will be automatically used (if it is supported). You can then log in to Gnome 3.18.3 from LightDM login page as root with password root. If your card isn’t supported you will get the dreaded error message saying Oh no! Something has gone wrong. 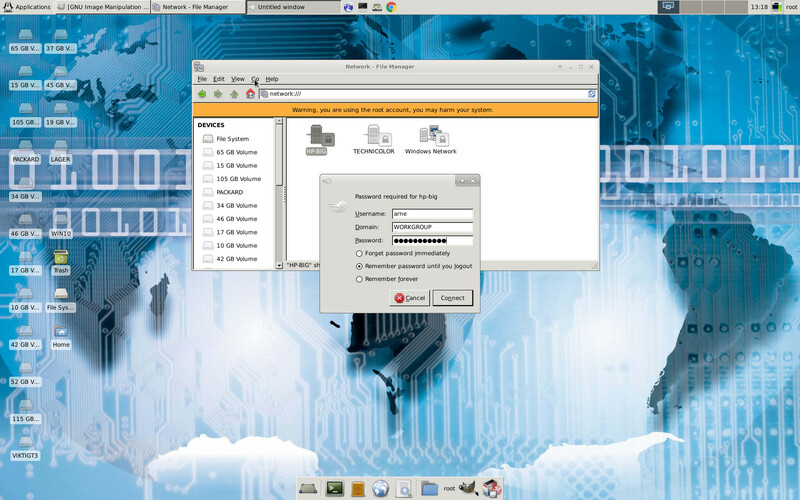 Then log out and change Desktop Environment to Mate 1.12.1 before you go on and log in again. You simply can’t log in to Gnome. Perhaps you can fix it yourself after a hard drive installation of DebEX Gnome!? I don’t think it matters too much. I.e. programs won’t crash or anything like that. I haven’t discovered any errors. Maybe you will if you do a full test of the system. Please let me know in that case.